TL;DR: A point form analysis by theme areas of the 2019 Manitoba provincial budget is below. When Jessica Floresco, MER General Manager, took me through their Indigenous-owned and operated social enterprise, I felt a rush of excitement. 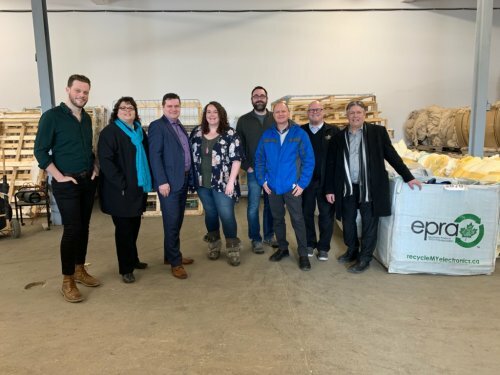 Extremely well thought out, MER provides meaningful training and employment opportunities to Indigenous peoples through environmentally sustainable initiatives - right now focusing on e-waste, mattress, and box spring recycling. Simultaneously contributing to landfill diversion and sustainability, inclusive employment, economic development, and poverty reduction, all while being prominently led and owned by Indigenous peoples and communities: Mother Earth is (pun intended) electrifying. MER’s model, like so many other members of Manitoba’s social economy and community economic development movement defines the problem and key challenges facing our communities, identifies root causes through an inclusive, equitable, and justice lens, and gets to work tackling them. My most recent tour was a group of five Members of the Legislative Assembly from the governing caucus. Bringing government to community economic developers is a crucial part of our advocacy work. Physically walking around and seeing skills and training in action in a supportive community - whether at Mother Earth, or at BUILD, or at Aki Energy, or at the multitude of other enterprises and organizations that are part of Manitoba’s social economy - set out a new paradigm to consider for our guests. Members explained to the MLAs that our sector is well positioned to fulfill government’s economic development strategy, climate change strategy AND poverty reduction strategy, let alone other goals like reducing number of children in care. Taking a tour of Mother Earth, among others, proves exactly this. On provincial budget day, I was shut in a grand room in the Manitoba Legislature to review the budget on behalf of members. During my hours there, I found it challenging to see the same support we heard for community economic development, and how our work can fulfill government strategies, reflected within the provincial budget. I was hard pressed to see key community challenges tackled at their roots with innovative, community-driven solutions. This presents a challenge for our Network. Clearly we need to bring more members of the government to see the social economy in action. But well beyond that, we must continue to collectively advocate for the web of policy and government interventions needed to tackle poverty and climate change, and to build an economy that works for everybody. To achieve this, the other part of our advocacy is crucial: bringing community economic developers to government policy. A thematic analysis of the 2019 Manitoba budget is below. While it is not fully comprehensive, and though many questions remain, it is meant to provide a snapshot of what’s going on with this web against our Network’s policy mandate. This is now all reflected in one budget line: “Community Development Program”. Right now it looks like funding for these programs is stable compared to last year’s actual spending (Budget page 98, $23,459,000), although when comparing budgeted amounts, this is a decrease year over year, as in previous years. We do not yet know with certainty how much of this would be spent on current projects or be available for new initiatives. There is also a decrease in funding for Salaries in the Community Development department, continuing a trend of the government to reduce costs in administration and management. being client-focussed, streamlined and reducing the administrative burden. recognizing the diversity of Manitoba communities and encouraging partnerships and collaboration. broadening the reach of grant programming to communities and organizations that have not previously been funded. The province released their long-awaited poverty reduction strategy in the same week as the budget. The strategy commits to a poverty reduction target of reducing child poverty by 25 per cent by 2025 according to 2015 levels, which according to Statistics Canada data, was already met in 2017. It also commits the provincial government to federal goals of reducing the national poverty rate by 20 per cent by 2020, and by 50 per cent by 2030. Thirteen indicators, including Canada’s Official Poverty Line will track the progress of the strategy. The strategy is organized around six priority areas—including priorities important to our Network, such as promoting economic inclusion through employment, education and training; facilitating partnerships and supporting community-based organizations; and making positive change through social innovation. The stated goal is that “all Manitobans have resources, opportunities and access to achieve a better quality of life”. Poverty eradication is the ultimate goal. For more on this, read this analysis from Make Poverty History Manitoba. The Provincial Sales Tax was decreased by 1 per cent, which the government says will benefit low-income Manitobans and save an average family of four $670 per year. To meet this number, low-income Manitobans would need to make upwards of $65,000 on discretionary spending where sales taxes apply. Increasing the Basic Personal Allowance on income taxes means that an additional 3810 Manitobans living on low income will no longer pay income taxes. The benefit of this measure is questionable since those Manitobans would have likely paid less than $50 in taxes anyway. Meanwhile, this increase to the BPA means all Manitobans pay less tax, even the wealthiest. The Employment Standards Code was updated in 2017 to index minimum wage to the rate of inflation, using a publicly-available formula. Minimum wage is targeted to raise to $11.65 starting in October. Any increase is welcome, although this means minimum wage continues to be well under a living wage for Winnipeg as calculated by the Canadian Centre for Policy Alternatives in 2017. The line for Employment & Income Assistance was combined with Rental Assistance (Rent Assist program), indicating an increase in spending overall for these income assistance programs, due to an increase in both EIA and Rent Assist participants. Community recommendations for a Livable Basic Needs Benefit were not adopted in the budget nor the poverty reduction strategy. The government remains interested in a plan to help Manitobans on social assistance move into the workforce and find jobs. A Skills, Knowledge and Talent Strategy is part of Manitoba’s Economic Growth Action Plan. An approach to meaningful employment and job creation through social procurement and social enterprise engagement has not yet been adopted by the provincial government. The federal government created a portable Canada Training Benefit, part of CCEDNet’s pre-budget brief (recommendation 11). This ought to be coordinated with the provincial government’s strategy. The childcare budget line has been decreased by about $1.5 million dollars. The bulk of this budget is spent on operating grants for childcare centres. Meanwhile, the waitlist for childcare spaces in Manitoba continues to hover between 12,000 and 17,000. Manitoba has now signed a bilateral agreement with Canada, the Investing in Canada Infrastructure Program. This agreement includes Community Employment Benefits, supporting meaningful employment targets for key demographic groups in Manitoba. We’re watching development of this program and will continue to advocate that our members and community economic development approaches are well recognized within this program. Bilateral agreement with the National Housing Strategy has not yet been signed, leaving key federal money on the table for social and affordable housing. The extent to which the province matches federal dollars, and how those combined dollars are allocated among rent subsidies, maintaining public housing stock, and supporting co-op and non-profit housing remains to be seen. Bilateral agreements ought to include Community Employment Benefits in new builds and renovations. With a yearly trend of decreases in funding for deferred maintenance and repair work of social housing units, the number and scale of procurement agreements between Manitoba Housing and workforce integration social enterprises is also trending downward. Since 2016, the provincial government has reduced investments in the maintenance of its existing stock from $120 million annually to $46 million. There is no commitment to building new social housing in the 2019 budget. Rent Assist has been combined in one budget line with Employment & Income Assistance. There is an increase in the budget line to account for more individuals accessing these programs. The Rent Assist deductible is now 30 percent for the second year in a row, rising from 25 percent in 2017. This means Rent Assist participants are expected to contribute 30 percent of income to rent. The increase in the deductible means that Manitobans living in social housing now have received a rent increase, and Rent Assist participants in private housing must pay more of their income toward rent. Co-operative development did not feature prominently in the 2019 Budget, even though there are more than 400 cooperatives, credit unions, and caisses populaires in Manitoba, comprising of over 900,000 memberships and more than $22 billion in assets. There is no longer specific mention of co-operatives within the Growth, Enterprise & Trade budget. It is unclear whether a third co-op developer staff will be re-hired by the province. Currently, there is a vacant position, and only two developers stationed in Portage la Prairie and Brandon, respectively. The Co-operative Loan & Loan Guarantee Board does not appear in the budget, and the Network continues to investigate the amount of loan guarantees provided to viable cooperatives in the province within this year’s budget. The budget for Entrepreneurship Manitoba, which offers small business and enterprise development services, is unclear at this point. The Network continues to advocate for restoration of funding for third party not-for-profit business and enterprise support services, particularly for low-income and rural Manitobans. While social enterprise is mentioned within the poverty reduction strategy and budget papers, a renewed Manitoba strategy for social enterprise sector development remains out of the budget. The province is working toward a procurement modernization strategy with PricewaterhouseCoopers Canada. This will now include ethical purchasing processes, and will incorporate all government purchases of goods and services. It looks like the procurement strategy is tending toward larger contracts, instead of several separate contracts that go through separate tendering processes. This practice has proven to be more challenging for implementing community employment benefits, as well as securing procurement contracts with social enterprises and small/medium-sized enterprises. The Network continues to work toward community employment benefit details within the Investing in Canada Infrastructure Program, as well as the forthcoming Bilateral Housing Agreement. A newly titled Healthy Child and Social Innovation Office has been created. It remains unclear what this office will be charged with, and whether a clear definition of social innovation has been settled on by the government. Fighting climate change did not feature prominently in Budget 2019. The reality of an 11 year timeline to reduce carbon emissions before irreversible global warming occurs, according to the International Panel on Climate Change (IPCC) 2018 Report also does not feature prominently in this budget. The budget papers includes an update on the Climate and Green Plan, including an update that the government is “well on its way to developing its initial 5-year Carbon Savings Account as committed to under the Climate and Green Plan.” The Carbon Savings Account is intended to indicate a reduction in greenhouse gas emissions. The federal carbon tax is now active in Manitoba. The provincial government announced that the provincial retail tax will not apply to federal carbon taxes. It remains unclear whether federal carbon tax incentives will factor into decreases in provincial income benefits to low-income Manitobans on assistance. A $102-million Conservation Trust is established. The fund will be managed by the Winnipeg Foundation and administered by the Manitoba Habitat Heritage Corporation, providing around $5 million in endowment income annually. These funds will be used to achieve goals related to “conserving ecosystems, enhancing natural infrastructure, improving water quality, and strengthening flood and drought mitigation and adaptation to the impacts of climate.” The funds are available to grassroots groups and non-government conservation organizations. Efficiency Manitoba is in place and a new CEO has been selected. The agency’s mandate is to play a key role in helping Manitobans reduce their carbon footprint. It remains unclear whether there is an opening to partner with this new crown corporation on social enterprise or community projects that contribute to carbon emission reductions, such as geothermal installations or green retrofitting.